Reading is a “higher activity,” according to our mosque teacher. It involves the brain, the mouth, and eyes. As Anna Gade tells us based on her research of recitation in Indonesia, perfecting one’s reading and recitation is one mechanism of internalizing the Quran and religious structures more broadly. 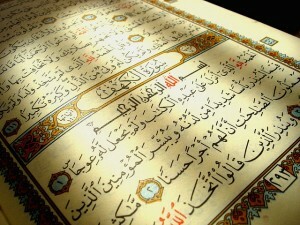 Recitation transforms the self, and in the process it augments one’s faith and makes one’s prayers more effective. When performed correctly, perhaps “beautifully,” and with heart, it leads to a heightened state individually and collectively. In French Salafi circles, unlike in the Indonesian context, there is no element of informal or formal competition in the art of recitation or any talk of beauty or musicality, which would likely be shunned. Nonetheless, we quietly admire the serene and perfectly melodic recitation of Amina, who hosts our study circle in her apartment. Amina is encouraging but intense. Sometimes she praises our recitation, and many other times she gently scolds us. Above all, the sessions have become a collective exercise and important, if fleeting, moments of solidarity.